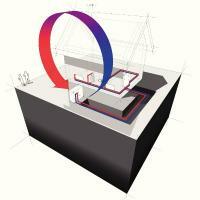 GROUND SOURCE HEAT PUMPS How does ground source heat pumps work ? Ground source heat pumps are a refrigerant based system. These systems absorb low grade heat from the ground or water then raise the temperature efficiently. This heat is then used for heating homes and businesses along with heating hot water. Ground source heat pumps use mainly renewable energy. They extract naturally stored heat in the ground through pipes buried in a garden and then send this heat to the heat pump itself. The heat pump increases the temperature and then distributes it through your homes heating system. This heat can then heat your radiators, underfloor heating and hot water. Ground source heat pumps can heat water to temperatures upto 65ºC even when ground temperatures are -5ºC. While heat pumps are considered renewable energy technology they do use some small amounts of electricity. For every unit of non-renewable energy they use ground source heat pumps provide between 3 and 4 units of renewable energy.